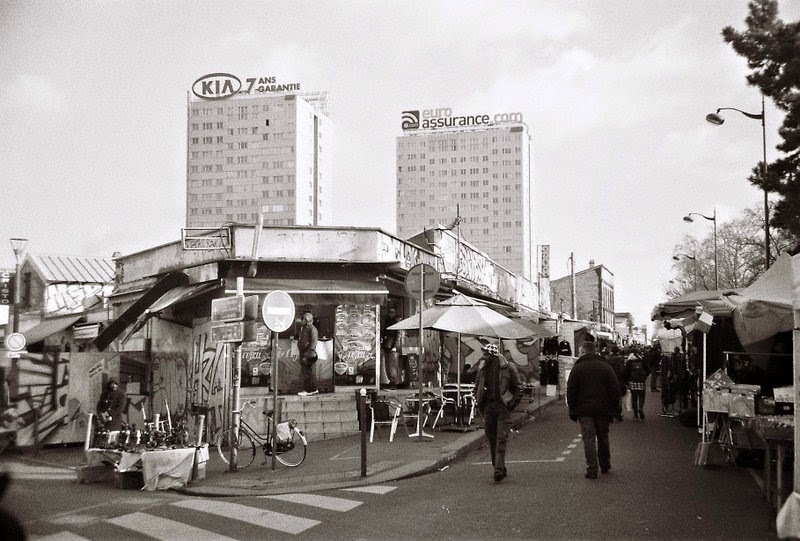 A winter’s day at the Saint Ouen flea market inspired writer and amateur anthropologist Blyth Brentnall to ask herself an important question; are we looking in the right places when we visit touristic sites? But, bedazzled by beauty from times long gone, a voyager like myself risks overlooking another mystery surrounding something that is less visible; what social life exists in this particular place? For me, an amateur anthropologist, the people, punters and sellers at the market, were of equal interest as their wares. The story of the humans in this part of Paris, in a certain snapshot of time, is worth considering if you yourself are to make a touristic pilgrimage to the area. One bleak, winter day, under a grey Parisian sky, I entered the market from the direction of the Porte de Clignancourt Metro stop. The first stalls I encountered were selling items such as brightly-coloured sweatbands for ‘goths’, or gimmicky t-shirts. If you look at ‘TripAdvisor’ or ‘Yelp’, the wares here prompt disgusted reviews, encouraging people to veer right in order to reach what they evidently see to be ‘the true market’. These insensitive reviews dismiss the blatant poverty of the people on this peripheral area of Le Marché aux Puces. 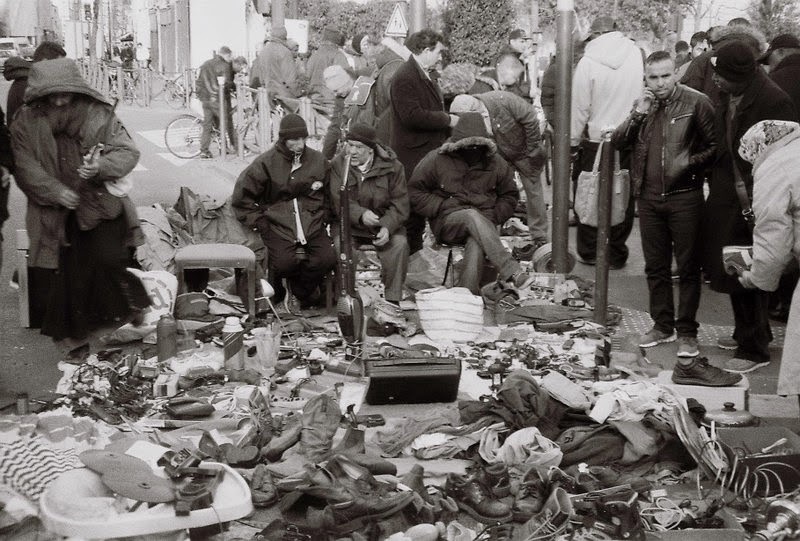 Historically, there was a similarly derogatory association with flea markets; ‘puces’ translates to mean the irritating insects which inhabit old clothes and bite their wearers. From the online reviews, it seems like this disdainful perception has stuck. But if you do not follow ‘Yelp’’s advice: “don’t make eye contact and keep walking,” and instead look straight into the eyes of the people there, you might see something different to what their reviews describe. I wandered amid the stalls of market’s periphery and tried to see people’s faces as they peered at spreads of various objects: shoes, plastic cameras, pirated DVDs. They barely noticed me, the middle class, comparatively privileged, white girl, and they were smiling at the “tacky items,” which I imagine for them were in fact necessary purchases. In this part of the market, the sellers, sometimes known as ‘biffins’, can operate legally provided that they pay a small sum of money. Here, in comparison to the more pricey area around the austere antique shops, it was thriving. Yet this busiest part of the market is censored from other travel writing about Le marché aux Puces, such as that featured in the New York Times. Here we find sanitized descriptions of luxury goods for the wealthy, tactfully excluding any mention of the overt poverty that lies adjacent to these riches. Nor do such travel reviews question the ethics of selling sacred or ritual artefacts amongst the antiques. 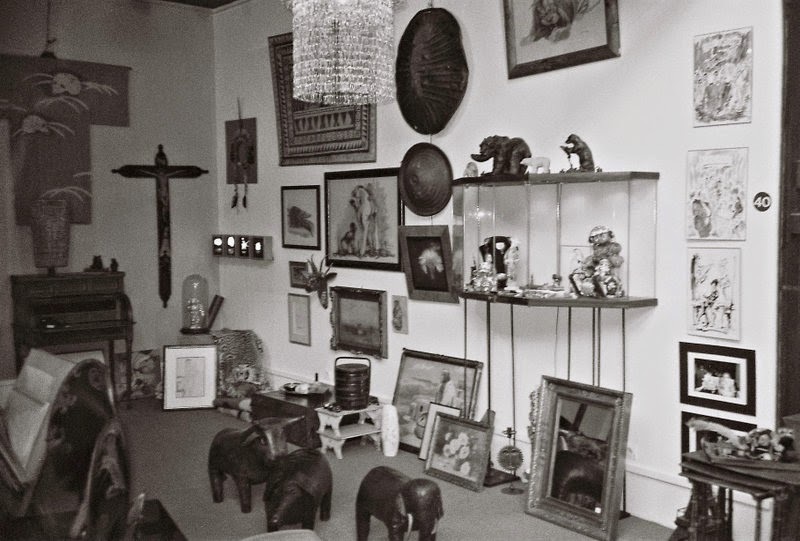 These are pinched from North American and African tribes, and there have recently been cases where tribes have gone to great lengths to reclaim items from French markets and auction rooms. While this thievery goes ignored, police are ordered to keep an eye out for stolen or illegal goods in the poorer market area. Their poverty gives them no choice but to reuse and recycle, something that the French middle classes can choose to do, not to save pennies but to be environmentally friendly. Their base in the area is La Recyclerie, a restaurant-bar, set up last summer in a renovated railway station next to the Metro Porte de Clignancourt. It is generally filled with throngs of students and trendy families, who go to such places to feed their conscience by eating food sourced from vegetable gardens running alongside the disused railway tracks. Inside, the left-luggage room is now decorated with pot plants, and the upstairs has been transformed into a space for craft workshops. It is a work of ingenuity in its reuse of available resources, just as the poor have had to do in the market. 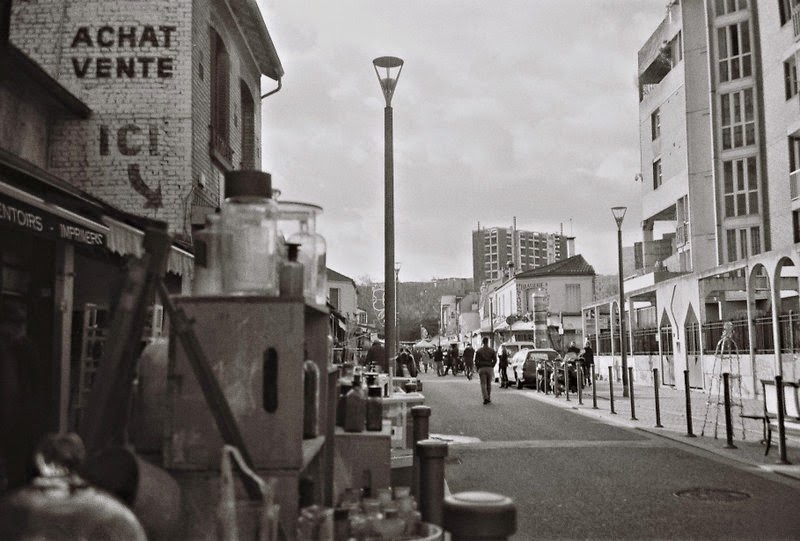 The people in Le Marché aux Puces seem to be on a grim historical trajectory; the present is different to the past, but at the same time all too similar. Originally accommodating for an exodus of poor tradespeople, Le Marché aux Puces came into being as travelling salespeople passed through Paris. Never rich in early years, it was also witness to an outbreak of the bubonic plague in the early 1920s. During my visit this month, it seemed as if the struggles of the original inhabitants had morphed into a melancholy emerging in a new era of migration, inequality and capitalism. Pre-revolutionary aristocrats banqueted whilst the poor starved. Today the rich parisian minority feast their eyes on grand antiques, whilst the poor take delight in the small things. But this, apparently, is invisible to the disgusted tourist. Text and photos by Blyth Brentnall. If you are interested in writing a piece for Invisble Paris, please send me a mail! Read more from Blyth on her blog, People in Paris. I am impressed with the thoughtfulness of this article. We always need to "see" ,even when we are tourists, the lives and culture around us. thank you for this interesting piece. Great new angle for experiencing the lives of people we'd otherwise not give a thought. Thanks so much! I appreciate such a humane, kind approach to this subject. We Americans seem to have lost our empathy too often. Maybe it's not just us. But I see such disdainful reviews a lot on places like Yelp and other customer comment web sites. They seem to forget it is human beings they are talking about. If I may, I would make a couple of language-nuance comments. In American English, the term "antiquated" implies something out-of-date or no longer useful. 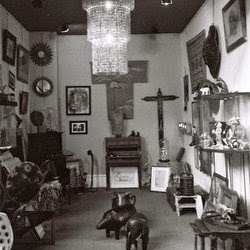 If an item is "antique" it just means it is old, more than 50 years usually. Also, here a "pot plant" is a Cannabis sativa plant in a pot. An unnamed plant in a pot would be called a "potted plant." I offer these for what they're worth, in the interest of furthering understanding. Thanks for this lovely essay. An invitation to travel with ones heart open so that we can really see. Thank you. Les Puces sont un vestige de la "zone" occupée par une population misérable de chiffonniers qui vivaient de la "biffe", c'est à dire du recyclage des déchets. C'est en partie à cause de cette tradition que les actuels biffins sont tolérés alors que les Puces se sont embourgeoisées. Les descriptions de ces vendeurs de déchets misérables ne datent pas d'hier (http://parismyope.blogspot.fr/2013/05/la-foire-aux-puces.html). Bravo pour ces billets qui sortent des sentiers battus ! I have been told that there are training courses available for biffins to become brocanteurs , a step up in the puces hierarchy . Is this true? Les Puces ont bien changées. J’y allais avec mon père dans les années 50s et on y trouvait encore des affaires. Maintenant avec tous les touristes ce n’est plus pareil. Un bon billet sur les dessous des Puces. The birth of a new République?